This is an old section of Pojo.com. It's being kept up for historical reference. The most informative and descriptive Pokemon Trading Card price guide on the Internet. Also, the most popular Pokemon Price Guide on the Internet. Great write-ups from fans about how their TCG decks have done in tournaments from around the globe. Tips & Strategies about the playing the Trading Card Game. Some very informative articles to help make you a master of the TCG. Having trouble with your Deck? Get a Tune-Up from one of our Deck Mechanics! There is some fun reading in here. Card of the Day - The CotD team picks a different card a few times a week, and goes over it with a fine-tooth comb! Want to know all the cards in the set, and what they say? Look no further. We help you tweak those Preconstructed Theme Decks, to help give you the winning edge against your friends. 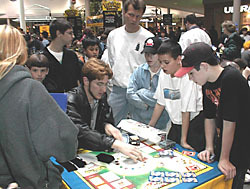 A great listing of the places to play TCG tournaments. Don't know how to play the TCG? Here is a great walk-through. This site is not associated with Nintendo, Wizards of the Coast, Creatures, or GAMEFREAK. Pokemon, Gameboy, and Gotta catch 'em all! are registered trademarks of Nintendo. The Pokemon Trading cards, and energy symbols are copyrights of Wizards of the Coast.